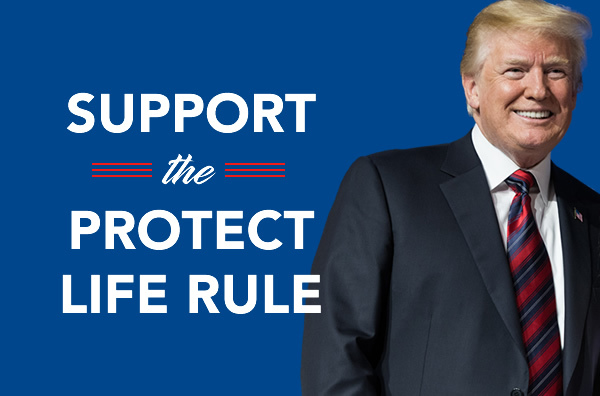 President Trump issued the new Protect Life Rule to stop sending Title X family planning dollars to abortion organizations like Planned Parenthood. Once in effect, we estimate Planned Parenthood will lose up to $60 MILLION of our tax dollars each year -- their second-largest source of tax funding! But before it can go into effect and start saving lives, it must undergo a 60-day public comment period. Now is the time for the Pro-Life Movement to stand tall and flood the Department of Health & Human Services (HHS) with comments expressing our support for President Trump's life-saving new regulation. Act Now! Comment on a Regulation!